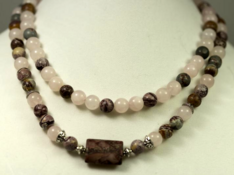 Made of rose quartz and jasper beads, these colors and textures go together well. It is closed by a toggle clasp. 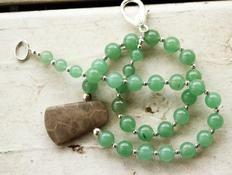 The necklace is 19 inches long in the inside strand. We take pride in our wide selection of quality products. All of the products we offer are designed and constructed by us and can be delivered to you within 2-3 business days. 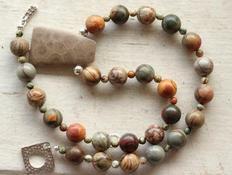 This beautiful yet earthy necklace is made of jasper beads and has a beautiful Petoskey Stone pendant. It is 18 inches long. 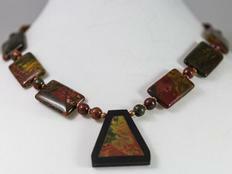 This necklace was constructed with all Red Creek Jasper beads except for the copper spacers and hand made copper toggle clasp. It is 18&1/2 inches long. 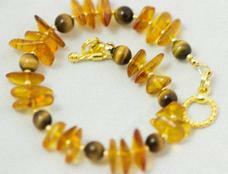 This lovely bracelet is made of amber and tiger eye beads, along with gold spacer beads. It is 7 inches long. Amber is thought by many to have healing properties. Amethyst is my birthstone and one of my favorites. 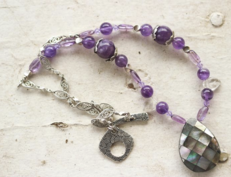 I used several different sizes and shapes of beads along with some crystal leaf beads, violet Swarovsky crystals and metal spacer beads. It is 20 inches long and has a toggle clasp.